Initially, your dentures may feel a little uncomfortable. Ill-fitting dentures may even be painful. However, the right fitting dentures are meant to be worn all day every day – not just for special occasions! Once your teeth are lost, your body begins to reabsorb the bone and not wearing your dentures can accelerate this process. You may even find that after a while of not wearing your dentures, they don’t seem to fit properly. Wearing a foreign object in your mouth could be a little bit awkward at first. Like anything new, dentures will need to be given some time to become accustomed to them. 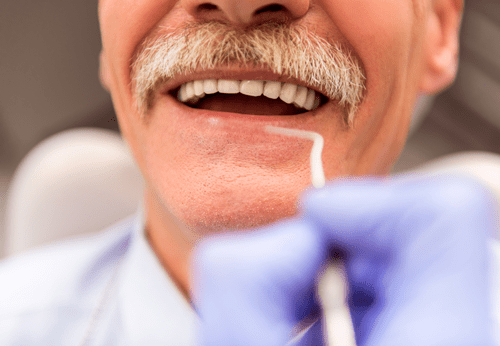 If you are not wearing your dentures on a daily basis, your gums will not be given enough time to experience the pressure and essentially will not become used to it. It is unfortunately one of those situations where you may need to endure some temporary discomfort to ensure ease at a later stage. Many people who experience tooth loss may experience malnutrition due to a lack of food options. For this reason, it is important to wear your dentures every day to ensure you can enjoy a wider range of food. It is true that dentures may not provide the same chewing ability as natural teeth; however, they certainly do provide more effective chewing than your gums! Massage: Massage your cheeks using both hands in circular motions for twenty seconds. Tongue Curls: After massage, practice curling your tongue in and out of your mouth making sure to hold each position for five to ten seconds. Enunciate: While massaging your cheeks, practice sounding out a few words. Repeat the words five to ten times during the massaging process. With regards to your speaking exercises, remember consistency: practice makes perfect! It is clear that wearing your dentures on a daily basis is important, perhaps your dentures have become so comfortable that you may not think twice about wearing them overnight! As wonderful as it is that you may feel completely comfortable wearing your dentures, they should be removed before bed, as you need to give your gums a rest. And what better time than when you are sleeping? While you sleep, the saliva in your mouth will create a protective barrier over your gums providing them with protection from any bacteria. Furthermore, placing your dentures in a glass of water with denture cleaning solution overnight will help clean them from any bacteria build up that may lead to bad breath of infection. This will also remove any debris, which you were not able to reach with a brush ensuring clean, hygienic dentures in the morning! Be sure to rinse your dentures thoroughly with clean water the next morning before placing in your mouth and you are ready to go! For more information on dentures, book a consultation with one of our dental professionals.